On a KwaZulu-Natal holiday at Giants Castle Nature Reserve, guests can rest, soak up the views, swim and enjoy the comfort of the Rest Camp or enjoy a variety of outdoor activities. Giants Castle Nature Reserve activities offer a peaceful escape into nature for relaxation. Enjoy Drakensberg hiking, birding, trout fishing and visiting spectacular San rock art sites. Year round here there is something for everyone to enjoy on a KwaZulu-Natal holiday in South Africa. The Rock Lodge Conference Centre can arrange a variety of interesting outings and team building activities suitable for delegates. These include guided cultural tours to the local amaHlubi community, traditional Zulu dance and song events, high-altitude guided trails and much more. Companies can take advantage of special group rates in May, June and July. Weddings and other functions can also be arranged in this exotic location for an unforgettable KwaZulu-Natal holiday. Giant's Castle is a hiker’s paradise, with a wide range of exciting hikes to suit all levels, from the amateur, to the professional or serious hiker. These hikes range from pleasant short walks, to more intense longer walks. Giant's Castle is home to a large sandstone cave containing prehistoric San rock art, one of the biggest and best preserved painted sites in southern Africa. This cave is situated about 45 minutes from camp and regular guided tours are available on a daily basis. There is a variety of self-guided day walks through the lower parts of the Giants Castle Nature Reserve throughout the year, weather permitting. Route guides are available from the camp office. There are over 170 known species of birds, including many raptors such as Bearded Vulture and Black Eagle in the reserve. Booking is essential for the hide where excellent viewing is offered of raptors from May to September. This is available throughout the year. Overnight hiking is suitable for experienced hikers. Tents are only allowed above the contour line, out of sight of the main camp. This takes place in the streams along the Bushman's River in season only (the closed season is between 1 June and 31 August). Swimming is possible in the summer months only and limited to parts of the Bushman's River below the drinking water in-take for Giants Camp. Visitors can see mainly Eland and other species of antelope, baboons, also some smaller mammals such as Rock Hyrax (Dassie) and Serval. The best sightings are in the winter months, but generally good throughout the year. There is limited ice climbing during the winter months only – visitors should make enquiries about related details with the camp. On the last Sunday in April every year the 75km (47 mile) Giants Castle Mountain Bike Challenge takes place in the reserve. This is a prestigious event and the only time that biking is permitted. Guests at this KwaZulu-Natal nature reserve in South Africa can hike or camp in this area throughout the year. 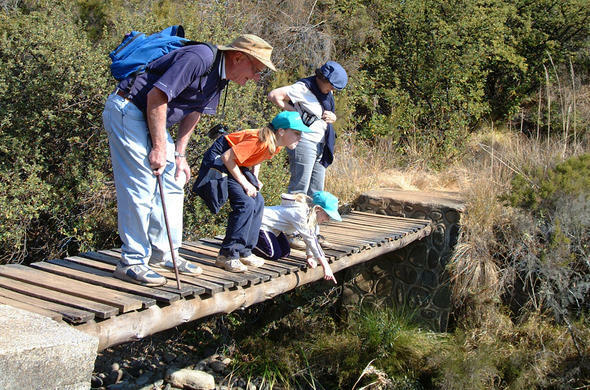 Overnight hiking in the Drakensberg is suitable for experienced hikers. Tents are only permitted above the contour line, out of sight of the main hutted camp. See ancient bushmen (San) rock paintings or enjoy mountain biking in this nature reserve in the Drakensberg, KwaZulu-Natal, South Africa.